Creating a niche of Wedding Wear Dresses , Party Wear Dresses, Casual Wear Dresses For UK such as Designer Suit, Designer Long Dress, International Salwar Suit, Salwar Kameez, New Designer Suits, New Designer Salwar Suit and many more items at its best, with utmost quality. Bottom embroidery work with velvet upper.Dupatta present in net with heavy border work golden karhai work. With black combination. Fabric- Velvet + santoon.Dupatta in net. 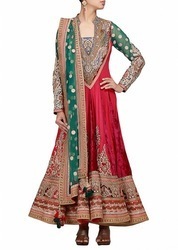 An superb Silk anarkali suit will make you look incredibly stylish and graceful. The brilliant attire creates a dramatic canvas with remarkable embroidered and resham work. Specially designed to wear for wedding functions, receptions, engagement ceremony and family occasions. New Designer Long Dress is offered by us to clients in wide range. The offered New Designer Long Dress is available in different colors and designs. We manufactured this New Designer Long Dress as per the latest fashions and trends. We are the leading supplier of this New Designer Long Dress. We also customized this New Designer Long Dress for clients as per their requirements. Matching to the huge market demands, we are involved in offering best quality of Long Dress. The offered Long Dress is available in the market in bulk at most reasonable rate. Further, the Long Dress is highly appreciated among the clients due to their soft and smooth texture.Long Dress is available in the market at reasonable rates and clients can avail these products in different sizes. Long Dress is shrink resistant and easy to wash. Matching to the huge market demands, we are involved in offering best quality of Long Dress. The offered Long Dress is available in the market in bulk at most reasonable rate. Further, the Long Dress is highly appreciated among the clients due to their soft and smooth texture. Long Dress is available in the market at reasonable rates and clients can avail these products in different sizes. Long Dress is shrink resistant and easy to wash.
Hand work on the full suit with with red flower design.Present in cream color with pink dupatta. Fabric- georgette with net work. color- cream suit with pink dupatta. Embroidery work onwhole suit.In dark blue an red color present.And dupatta in two multi color red and dark blue color. color- dark blue and red. New Designer Salwar Suit is offered by us to clients in wide range. The offered New Designer Salwar Suit is available in different colors and designs. We manufactured this New Designer Salwar Suit as per the latest fashions and trends. We are the leading supplier of this New Designer Salwar Suit. We also customized this New Designer Salwar Suit for clients as per their requirements. We are the leading Exporter, Manufacturer and Wholesaler of Salwar Kameez. Printed suits in Canderi cotton fabric with chiffon printed dupatta.In cream and pink color. Latest Salwar Kameez Designs is offered by us to clients in wide range. The offered Latest Salwar Kameez Designs is available in different colors and designs. We manufactured this Latest Salwar Kameez Designs as per the latest fashions and trends. We are the leading supplier of this Latest Salwar Kameez Designs. We also customized this Latest Salwar Kameez Designs for clients as per their requirements. We are the leading and prominent Exporter, Manufacturer and Wholesaler of Indian Salwar Kameez Designs. We are the manufacturer and supplier of Bollywood Salwar Kameez . Our company is the foremost in offering Beautiful Long Dresses to the clients. This product is praised for stylish appearance, appealing look, perfect fitting and fashionable look. Beautiful Long Dresses can be availed in various standard sizes for the clients. Offered range is fabricated using best quality dyes, advanced technology and fine grade fabric that ensures colorfastness. This product is widely cherished among customers for shrink resistance nature and excellent quality. Offered range is thoroughly checked prior to final deliverance at respected clients end.